Okay, I’ll admit, this year it’s been particularly difficult for me to stick to my diet. Maybe it’s because I’ve not got any vacations planned, but every time I’m supposed to hit the salad bar I’ve ended up making a beeline for the bars, or piling on the extra cheese. But I tell myself that, hey, it’s not my fault! Nah: it’s all down to the sinister machinations of the sugar industry, a conspiracy to keep me eating delicious junk food. I mean, how can I resist? It’s just impossible. When it comes to Krispy Kreme doughnuts, as they call ’em – it’s doubtful that any other flavour or brand will ever be as popular as the classic kind with frosting and plenty of sugar sprinkles. But Krispy Kreme, the titans of the pastry industry, have teamed up with Reese’s, those Willy Wonkas responsible for those gorgeous gooey peanut butter cups. God I’m getting hungry just thinking about them! 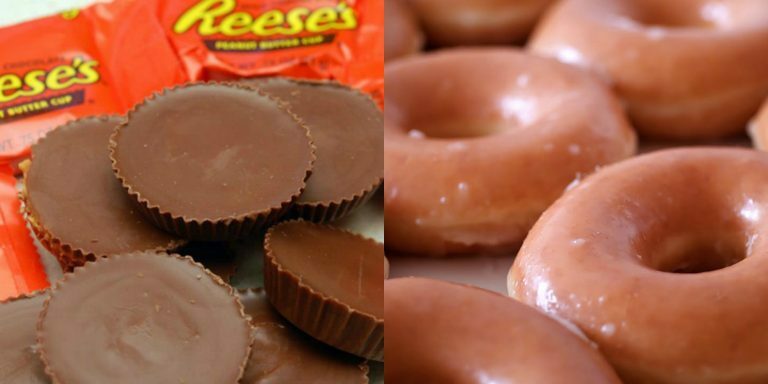 Just months after having the benevolence to shower us all in Nutella-filled donuts, Krispy Kreme has teamed up with Reese’s to invent the all-new, chocolaty donut-candy hybrid. Specifically, the Reese’s donuts feature a Reese’s peanut butter sauce filling, chocolate icing, and toppings like Reese’s peanut butter chips, vanilla cookie crumbs, and more chocolate drizzle, according to the company’s website. 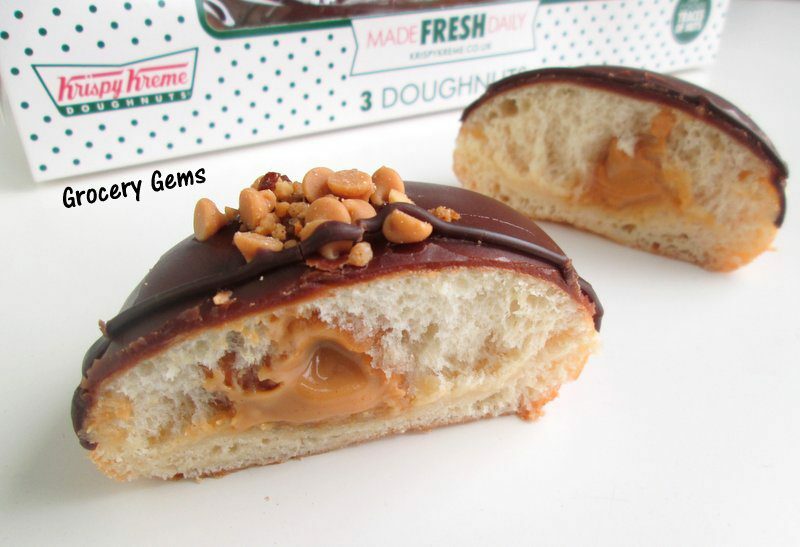 They’ve even come up with a handy slideshow which reveals that gooey peanut butter inside. The bad news is that it looks like these wonder donuts will only available at Krispy Kreme shops in Australia. However, seeing as there are few things more American than eclectic junk food combos, we remain ever-hopeful that these sticky delights will arrive in the US and Europe someday. On a more positive note, Krispy Kreme is still serving special edition “internationally inspired” donuts — Crème Brûleé, Tiramisu, and Churro — at its US locations through August 28th. Yum! And Krispy Kreme’s best minds have even put their heads together to come up with something even more impressive: the Krispy Kreme Ice Cream Sushi Roll. *Drools.